If you’re thinking about making a Power of Attorney in Wellingborough then contact us via telephone on 01536 276300 or use our online contact form. Nobody knows what the future holds and situations can arise, such as failing health, where we are no longer able to take care of our own affairs. Have you ever considered what would happen to your home or savings if you struggled physically or mentally in being able to look after your own affairs? What if you became physically or mentally unable to manage your own affairs or understand what you were doing? How would your savings, property and assets be dealt with if you were completely unable to deal with things on a long term basis? This might not have any relevance at all to your life right now, but it could be important to you in the future. However, there is a way to prepare for such a circumstance before it is too late to do anything about it. The law allows you while capable, to determine who can intervene in your property & financial and health and personal affairs in the event of your incapacity. The way to do this is to make a Lasting Power of Attorney. 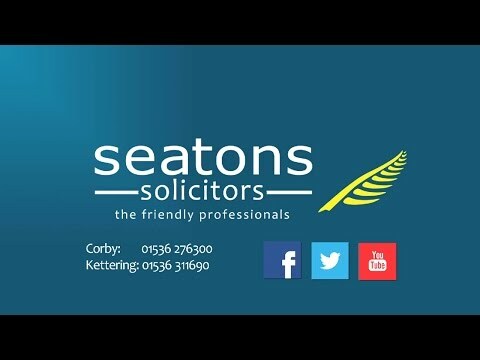 We at Seatons are able to provide you with all the information and advice you need so you can make the right decision. We can prepare the necessary documents and forms and sort out it all out for you. Lasting powers of attorney (LPA) replaced enduring powers of attorney (EPA) as a legal document which gives another person or persons (the attorney) the authority to act on their behalf in the event that they no longer wish to deal with their finances or they are unable to do so. The Mental Capacity Act 2005 (the MCA) came into force in England and Wales on 1st October 2007. Any enduring power, validly made before 1st October 2007, can continue to be able to be used, but only in respect of property and affairs. All or specified matters concerning the donor’s property and affairs. Such as dealing with financial institutions, utility companies, entering into certain contracts and selling land. Do not have authority to make a will, swear an affidavit on behalf of the donor, or litigate, unless as a litigation friend. An Attorney does not have authority to make gifts unless on customary occasions, for example, birthday and wedding presents or on occasions where presents are customarily given within families or among friends or associates or to a charity to whom the donor made or might have been expected to make. Any gift must be reasonable in size in relation to the donor’s estate. All or specified matters concerning the donor’s personal welfare. Such as medical treatment, social care, medication or where a person lives. Only to be used when the donor is unable to make the decision for him or herself. The donor must choose to give or not give his or her attorney authority to give or refuse consent to life-sustaining treatment. Life sustaining treatment is defined as “treatment that in the view of the person providing health care is necessary to sustain life” s4 (10) of the MCA 2005. Do not have authority to authorise euthanasia. As with any power of attorney, it is an important document and you should take care whom you appoint as they should be trustworthy and have appropriate skills to make the proposed decisions. If you appoint more than one attorney, you can appoint them to always act together (jointly) or together or separately (jointly and severally). You may even appoint them to act jointly for some things and jointly and severally for others, although this should only be done with advice, as it may cause problems when using the power. When can the Attorney act? The attorney will only be able to act when the LPA has been signed by you and your attorney, certified by that person that you understand the nature and scope of the LPA and have not been unduly pressured into making the power. The certificate will also need to confirm there has not been any fraud or another reason why you cannot make the power. It must then be registered with the Office of Public Guardian before it can be used. The property and financial affairs LPA can be used both when you have capacity to act, as well as if you lack mental capacity to make a financial decision. The health and welfare power can only be used if you lack mental capacity to make a welfare or medical decision. Any enduring power, validly made before 1st October 2007, can still be used but only in respect of your property and financial affairs. If you wish to give authority over your health or welfare you will need to make a health and welfare LPA. What happens if you have not made a LPA or EPA? If you lack capacity to make a financial decision, then it may be necessary for an application to be made to the Court of Protection for an appropriate order, such as appointing another person to make decisions on your behalf. This is both costly and time consuming. Most care and treatment decisions can be made on your behalf without the need for a court application. However, if you wish to avoid potential disputes, you can give a person(s) authority to make those decisions on your behalf by making a health and welfare LPA. See the benefits making a power of attorney provides and more information here. To revoke a Power of Attorney you must complete and sign a formal document. Find out more here. From 2007, Enduring Powers of Attorney were replaced with Lasting Powers of Attorney. A Health and Welfare LPA can deal with all aspects of a person’s health and personal welfare. Planning for the future is very important, and sometimes we put it off or leave things a bit too late. Don’t delay. Take action now. A Living Will only relates to the provision of healthcare and does not allow any decisions to be made about financial matters. Find out why you should make a Power Of Attorney here. For more help, contact us. If you have mental capacity it means that you are able to make your own decisions. There are many different reasons why an you can object to a Power of Attorney. Useful information to gather when considering an LPA. We can help and offer a competitive fixed fee for this service. A person may at some stage in their life struggle to deal with their property and affairs. In order for an LPA to be valid and be used by the Attorney it must be registered. We offer competitive prices for Power Of Attorney’s, click here for more information. Hello, my name is Adrian Chambers and I am a solicitor who specialises in creating and advising on Powers of Attorney in Wellingborough. I can offer a low cost legal service and aim to sort everything all out for you quickly and easily. Property and Affairs Power of Attorney is the most common one used and it gives you peace of mind should you ever need someone else to look after your affairs. If you’re thinking about making a Power of Attorney in Wellingborough, contact us via telephone on 0800 3 10 11 12 or use our online contact form. When someone is unable to manage their financial affairs an Enduring Power of Attorney is a useful tool to enable someone else to take over this responsibility. Attorneys have a duty to act in the best interests of the Donor (person who gave them the Power to act as Attorney). This includes only making gifts which the Donor would ordinarily have made for seasonal purposes and only then with regard to the Donor’s funds at the time. In a minimally conscious state, a 72-year-old woman was unable to tell anyone what she wanted in terms of medical treatment or intervention, this left the court to decide on her behalf, taking into account what she might have wanted.